Are you ready for a quick kumite footwork drill that helps develop strong quads, explosive movement and agility? You’ll need a sparring partner and a pair of focus mitts. Partners face each other in their fighting stance at kicking range, left leg forward. The Target holds the mitts in front of their body with palms touching (picture and imagine praying). The Fighter waits in anticipation for the Target to present the mitt to hit. With their left hand the Target shows the mitt at a position for a front leg jodan mawashi geri (upper level roundhouse kick). The Fighter skips up with the back foot, chambers the knee and fires off the kick, recoiling the leg and placing their foot to the ground next to their other foot, legs slightly bent at the knees. At the same time the Target EITHER shuffles backwards or pushes forwards one slide . The Fighter must react appropriately after the kick. In the case of a retreating Target, the Fighter pushes forwards using the loaded spring of the BACK LEG into forward stance, and delivers reverse punch. In the case of an advancing Target, the Fighter pushes backwards by loading up the FRONT LEG and driving backwards. At the same time the Fighter must move the back foot as to regain their original fighting position, and follow with slide in reverse punch. Typically we to this exercise for 10 repetitions before changing roles, and of course then working the other side of the body. The objective is for the fighter to develop strong explosive movement, to be able to anticipate the target’s movement and react appropriately ensuring proper distance and timing for their technique. How many karate-ka does it take to change a light bulb? Just one. But he’ll do it 10,000 times with his right hand, then 10,000 times with his left. In all seriousness as much as we karate-ka like to think we are equally proficient on both sides of our body, the reality is we’re not. The fact is most of us are right-side dominant, and not as coordinated as our left-handed brothers, since “lefties” have to adapt to our right-handed world. Anyhow, let’s get back to the original point. Typically, by nature we are a one-side dominant species. Approximately 85% of people are right-handed according to Scientific American. Well it’s to do with the left brain controlling the right side of the body. The left brain is also what controls speech, and when the written word came to be, it was therefore natural to write with the right side. This explains why other primates (who can’t speak or write) don’t tend to favor their right side, yet us wacky humans do. 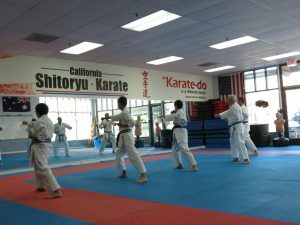 However one of the requisites of karate is that we train both sides equally. But how many of us seriously do that in every aspect? ZERO would be a good guess. It would be a fair assumption most traditional karate dojo practice either Pinan or Heian kata, wouldn’t you agree? If we look further at kata it’s apparent they were developed for defense with right side attacks first in mind. Think about the first move in any pinan/heian kata… you turn/move away from a right-handed attacker. In addition many of the finishing techniques/kiai points are made on the right side of the body. This holds true for almost every kata. This evidence reinforces karate is a right side dominant fighting system. Try doing Pinan/Heian Godan as the mirror image of what you regularly practice. You’ll probably get through it, but not smoothly. There are certain techniques that you almost only ever apply with the right side of the body. And when you attempt the lefty version of these you’re bound to feel like a beginner all over. Consider the kosa dachi/uraken kiai point in Pinan/Heian Godan, or the first move in Bassai Dai for example. How often do you practice these moves on the left side during kihon (basics) or bunkai (application) practice? I’m guessing not very often if at all. The left photo shows the first kiai point in Pinan Godan. The right picture is a reverse image of the same technique. With all of this in mind, it becomes apparent why lefties tend to do quite well at karate since they already have the left side dominance as a natural ability. They learn through repetition to be proficient with their right. Often times they can hit just as hard with either side of the body, or perform difficult techniques on either side without much thought. And if you’re a right-handed karate-ka, guess what? Your right will almost always be stronger and more coordinated no matter how much you practice both sides equally. It has the natural advantage already. So equal numbers of reps will keep it ahead of your left, less dominant side. In order to feel more coordinated on your weak side, a simple exercise would be to make a list of movements from kata for which you only practice the right side of the body. Take those movements and incorporate those directly into your kihon (basics) section of class and you’ll see a marked improvement in your students’ skill sets. For example, from yoi dachi have your students step in (on your count) to kosa dachi and make uraken per the picture above. On the next count have them return to yoi dachi. On the next count they step in with the other side of the body. Repeat. What other techniques can you think of to practice in this manner?